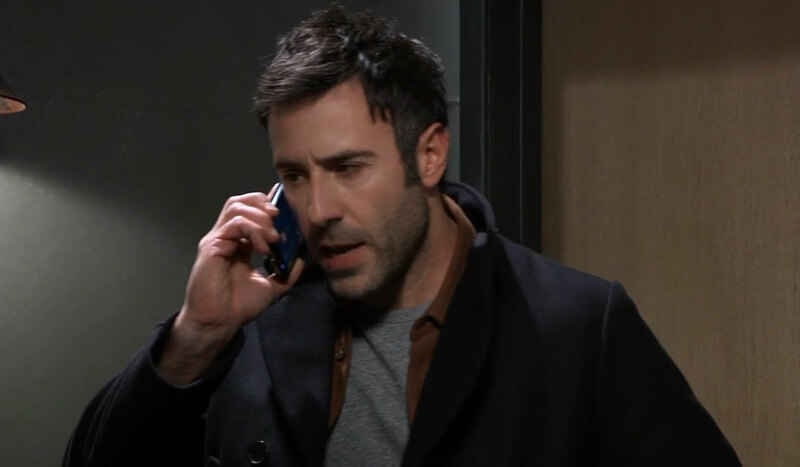 Wednesday February 13, 2019: Shiloh invites Jason to the DoD Valentine's celebration, Sam tells Kristina and Alexis she and Jason broke up, and Dr Cabot realizes Finn and Robert want something from him. Robert and Finn arrive at the clinic in Sweden to meet with Cabot. Finn calls Anna to check in, but she surprises him for Valentine’s Day by appearing at the clinic. An annoyed Robert suggests she wait for them at their hotel bar because if Cabot sees her then everything will be blown. A nurse enters and asks if she can help them. Finn introduces himself and says he and his colleagues are there to confer with Dr. Cabot. The woman explains Dr. Cabot doesn’t work there and instead is a patient. He also hasn’t wanted visitors but may make an exception for Finn. She leaves and returns with Cabot in a wheelchair. Cabot reveals Finn’s name is unknown to him, and he’s blind and cannot see his face to recognize it. Finn explains he came to confer with him but didn’t know he was a patient and had gone blind. Cabot says the blindness came on suddenly a few months ago. Finn explains he’s treated a similar condition in other patients, all resulting from a long-dormant virus. Cabot asks about the other patients. Finn can’t break patient confidentially but assures him that he cured them and gave them back their sight. Cabot realizes he wants something in return. Robert, who Finn introduces as an associate from Sydney, tells him they will help him if Cabot helps them. Finn wants more information on his research on identical twins, specifically the aspects he never published. Cabot wonders why he should tell them anything. Anna blurts out, “Answer our questions if you want your sight back!” Cabot recognizes her voice. At the Metro Court, Willow leaves a message with Chase because she thought they were meeting after school was over. She runs into Brad, who has Wiley, and realizes by his nerves that Brad knows she is Wiley’s mother. Willow blurts out that she wants a relationship with her son. Elsewhere, Alexis meets with Kristina, and they discuss DoD and how happy Kristina is in the group. 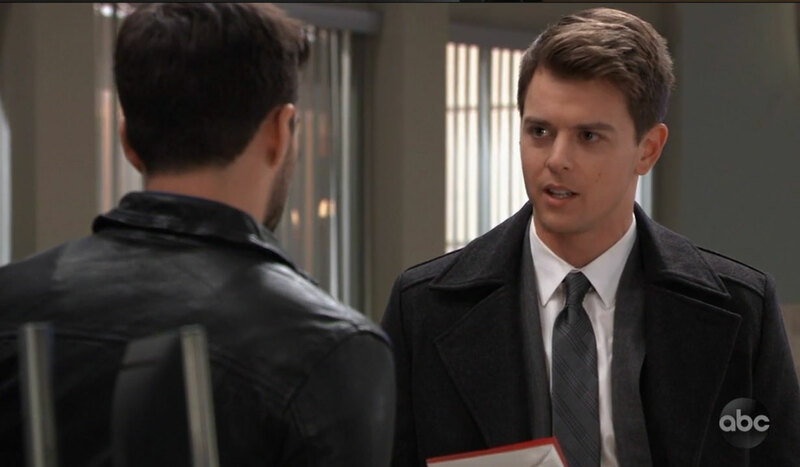 At GH, Michael speaks with Chase and tells him that he got a Valentine in the mail from Nelle. It reads, “Thinking of you and our sweet Jonah.” Michael says she enjoys bringing up Jonah to him and twisting the knife. Michael trashes the Valentine, and Chase realizes he’s late meeting Willow. Michael inquiries about their relationship and Chase admits he really likes her. Sam is about to sneak out of Jason’s place when there is a knock at the door and from the other side Shiloh identifies himself. They stay quiet, so Shiloh calls Jason, leaving a message explaining he got his information from Kristina. He feels Jason’s trip to Beecher’s Corner was unnecessary, and he’s happy to answer any questions. Shiloh leaves, and Sam can’t believe Kristina gave Jason’s information to Shiloh. Sam decides to go meet her sister and mom and tell them they aren’t together anymore to keep up their charade. Jason storms into the DoD house and confronts Shiloh. Jason asks why he left Beecher’s Corner for Port Charles seeing how popular he and DoD are there. Shiloh claims he is up to nothing other than spreading the word of DoD and helping people. He believes he can help Jason overcome the obstacles keeping him and Sam apart. Jason notes it always comes back to Sam with him. Shiloh warns him the path he’s walking is a dead end, but Jason decides to take his chances on it. Back at the Metro Court, Sam meets with Kristina and Alexis and tells them that while she will always love Jason, she has realized they are on separate paths. He is not open to self-discovery as she is, and she needs to follow this new path she’s on. Kristina is proud of the huge step Sam’s taken towards enlightenment. After Kristina takes off for the DoD house, Alexis asks Sam to level with her as to what’s really going on. Sam won’t comment but promises everything she’s doing is to help Kristina. Meanwhile, Willow assures Brad that while she wants to know her son, she knows it’s best nobody ever learns she’s his father, including Wiley. Michael arrives as Brad is trying to escape from Willow, and takes advantage of the situation to get a moment with Wiley. Chase enters, and he and Willow excuse themselves for their date. Michael reveals to Brad that he received a Valentine from Nelle, but Nelle is his past and he’s looking towards his future. At their table, Chase apologizes to Willow for losing track of time. She admits she was afraid she scared him off after admitting she gave up her baby. He assures her that he doesn’t want to stop seeing her, but is glad she was honest with him because trust means a lot to him. Valerie asks Kristina if they can be friends again. Cabot says, “You’re the other one,” to Anna. In bed, Sonny tells Carly that he loves surprises. Shiloh tells Sam she needs to find peace within herself and stop running.